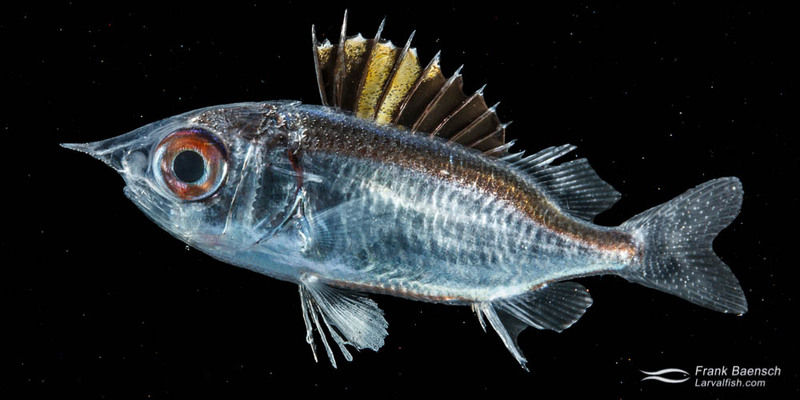 Hawaiian Squirrelfish larvae (Sargocentron xantherythrum) were raised from wild-spawned eggs at 77-79F on wild copepods and artemia. The larval duration was 50 days. First record of Squirrelfish culture. Holocentrids are nocturnal, large-eyed, typically reddish, small to moderate sized fishes, comprising 8 genera and 83 species. During the day, they typically remain hidden in crevices, caves, or under ledges at depths from the shoreline to 100 m (330 ft). The family is divided into two main subfamilies, the Holocenrinae (Squirrelfishes) and Myripristinae (Soldierfishes). Soldierfish feed mainly on large zooplankton whereas squirrelfish feed on benthic invertebrates and small fishes. Some Holocentrids, such as soldierfishes (mempachi) in Hawaii, are commercially important as food fishes. Adult Hawaiian Squirrefish (Sargocentron xantherythrum) on the a reef in Hawaii. Hawaiian Squirrelfish (Sargocentron xantherythrum) were raised from eggs collected in coastal waters off Oahu, Hawaii in May 2015. S. xantherythrum eggs are pelagic and measure 0.7 mm in diameter with an embryo and oil globule that have a light orange tint. The larvae began to feed on copepod nauplii 3 dph at 3.1 mm TL. The large, single, serrate rostral spine, characteristic of all squirrelfish larvae (the rostral spine of soldierfish is bifurcate), began to form near 10 dph at 3.5 mm TL. The larvae underwent flexion between 19 dph (5.7 mm TL) and 25 dph (7.3 mm TL). Postflexion larvae developed a blue sheen below the dorsal fin and became increasingly nervous, swimming actively, sometimes erratically, around the tank. Hawaiian Squirrefish (Sargocentron xantherythrum) larvae reared in the laboratory. Mortality was highest during the late flexion to early postflexion period. The first red pigment and bottom orientation was observed near 35 dph (10 mm TL) at which time activity level decreased. Settlement appeared to be complete near 50 dph (16 mm TL) when the rostral spine had fully receded and red pigmentation had filled in. The major specialization to pelagic life of S. xantherythrum larvae is the complex rostral spine and extensive spination of the head and the early formation of the pelvic fins and scales. The delicate spines and nervous nature of late stage Hawaiian squirrelfish larvae makes them a challenge to raise in smaller tanks.